We’d like to pay tribute to your heart. That all-giving organ continues to stand out as Panama City, Mexico Beach and other parts of Northwest Florida including Gadsden County try to recover — in some places all too slowly — from the devastating effects of Hurricane Michael. The storm also reached into southern Georgia and beyond. You’ve read the stories of the human response to the hurricane, among the most intense ever to hit the United States. Neighbors, citizens, businesses and organizations near and far mobilized almost immediately in the wake of the October storm, illustrating that human tendency to act in the face of suffering. Hurricane Michael spared Tallahassee the brunt of its wrath, yet the storm created its share of disruption and discomfort in the Capital City. It felled scores of our city’s hallmark and heartbeat — our beautiful trees. It damaged property. It left most residents without electricity for days. Even as you waited for electricity to be restored, you responded, clearing each other’s debris, sharing food and supplies, and coming together for community dinners and cookouts. Without hesitation, you opened your hearts. For thousands southwest of here, life still hasn’t returned to normal. For many, it never will. Yet the outreach continues, and Tallahassee residents continue to pitch in. Consider the accompanying photo, which made the cover of Emerald Coast Magazine, one of Tallahassee Magazine’s sister publications. 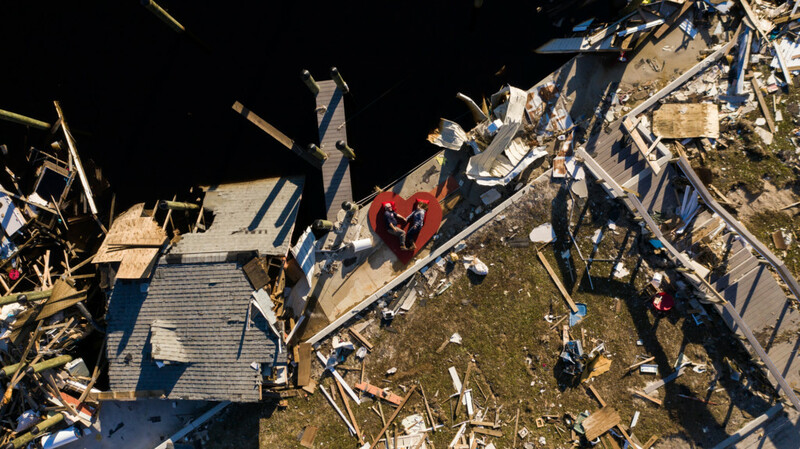 It shows Mexico Beach Mayor Al Cathey and his wife, Carol, lying near hurricane rubble on an oversized heart. That’s part of a photo project that aims to help in the recovery of Mexico Beach, through neverforgottencoast.com and stories of residents who found themselves in Michael’s destructive and life-changing path. The photo project and website represent a creative collaboration of Tallahassee residents Alex and Chelsea Workman and nationally acclaimed photographer Jeremy Cowart. So many people and organizations have helped. Sonder Project co-founder Ashley Horsley and about two dozen other volunteers worked on roofs, cleared yards and did what they could to provide comfort to some other areas of Bay County. Let’s follow these people and organizations and continue to show some heart. Let’s do one thing that will make a difference for our neighbors and for one of the most special places on the planet.